The Rutgers NJAES Rediscover the Jersey Tomato program offers a portfolio of seeds of classic Jersey tomato varieties: Rutgers 250, Ramapo, Moreton, and KC-146 (aka Campbell’s 146). Each of these varieties has been resurrected by Rutgers to maintain the availability of tomato varieties that were once grown by Jersey tomato growers in the mid-twentieth century, and to support Rutgers current breeding efforts of producing commercial varieties for farmers that not only produce well, but taste good too. Tomato seeds should be started indoors 6-8 weeks before the outdoor transplanting date (for ex., for Central NJ start indoors: late March/early April; transplant outside around mid-May). Rutgers 250 tomato: Rutgers 250 is the result from crossing the same parent varieties as the original ‘Rutgers’ tomato that was released by Rutgers NJAES in 1934. ‘Rutgers 250’ was selected for high fruit quality and flavor and has been named in honor of the University’s 250th anniversary in 2016. 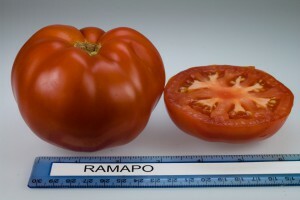 Ramapo F1 Hybrid tomato: Ramapo was developed at Rutgers NJAES and released in 1968. It was prized by gardeners for its great flavor, fruit quality, reliability, and productivity. 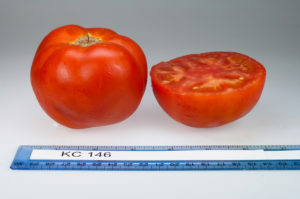 While Ramapo seed was unavailable for many years, Rutgers NJAES continued receiving requests for this popular tomato and eventually reintroduced Ramapo F-1 seeds in 2008. 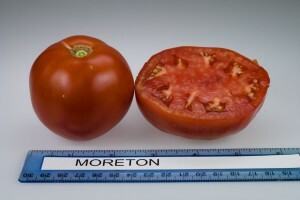 Moreton F1 Hybrid tomato: Moreton was Harris Seeds’ first F-1 hybrid, released in 1953 and one of the first hybrids grown by Jersey tomato growers. 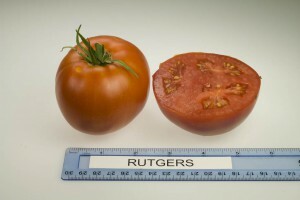 This early maturing, tasty variety was off the market and re-introduced in a cooperative effort by Harris and Rutgers. Moreton makes a good earlier maturing garden companion to Ramapo and KC-146. Note to commercial growers: Bulk Moreton seed is available from Harris Seeds (http://www.harrisseeds.com). KC-146 tomato: KC-146 (also known as Campbell’s 146) was developed by Campbell’s Soup Company as a processing tomato and released in 1956. This variety was wilt and crack-resistant and better flavored than other processing types. It was eventually replaced with newer varieties with a more disease resistance. Campbell’s maintained the KC-146 stock as their flavor standard. We agree, this is one tasty tomato!